During the contest period, Joey was a junior at Colleyville Heritage High School. He was also a registered AP student, and a member of the National Honor Society, the student council, the robotics club, the football team, and the German club. He has lettered in strength training and marching band. Joey is on track to depart high school as a State Foundation STEM Endorsed Graduate, an AP Scholar, and a Community Scholar Ambassador. He plans to earn an appointment to the United States Naval Academy at Annapolis, Maryland, major in Aerospace Engineering and serve as a Marine Corps pilot. Immediately following the contest period, Joey was named the Colleyville Chamber Youth of the Year, and he attended Texas Boys State where he was the Mayor of McGee City and he was nominated by his counselors for Boys Nation. 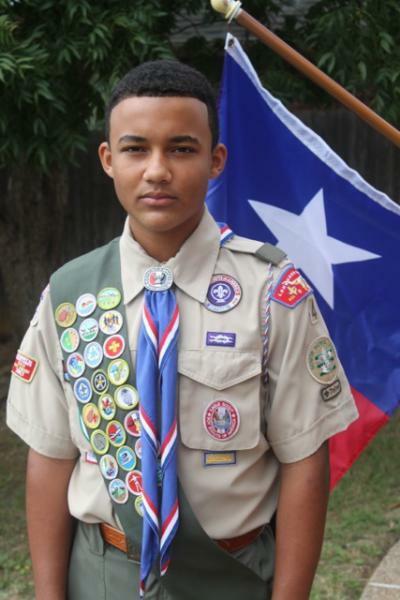 - Eagle Scout with Gold Palm. - Brotherhood member of the Order of the Arrow, Scouting’s National Honor Society. - Eagle Scout Service Project was a 1500+ flag retirement for Post 379. - Venturing Summit Award recipient. - Summit Award Service Project was laminating the main stage and adjacent back wall for Post 379 just in time for the 2017 Department of Texas High School Oratorical Winner, Isaac Taylor, to start his oratorical journey from that stage. - Served one year as the only Den Chief for Cub Scout Pack 546 which is charted by Post 379.